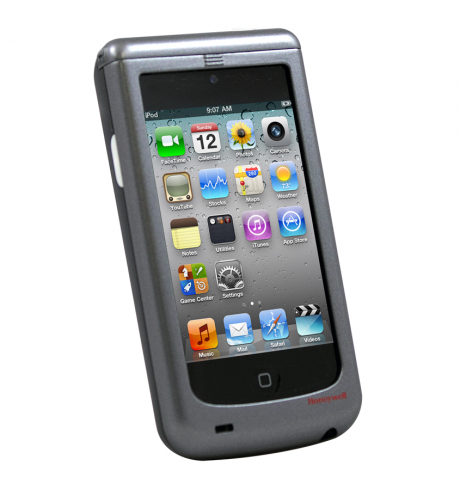 To use a smartphone as a practical mobile terminal – this is a reality with the Honeywell Captuvo. In combination with the Apple iPod Touch, iPhone or iPad Mini, you expand the mobile devices’ functionality to improve personal customer relations, for example, or to effectively and quickly add something to patients’ medical records. With its integrated 2D imager you can find out and compare data within seconds, or search for similar products. With the corresponding application from the Apple App Store you turn the Captuvo into an affordable jack-of-all-trades for inventory, in sales support and doctors’ offices. In the App Store there are more than 650,000 applications available which powerfully support this handy tool. Several programmed apps make the Captuvo even more efficient. Operation via its touch display is easy, as you are accustomed to, plus the scanner and optional card reader are just as easy to operate. With one simple hand movement you secure the Apple device within, so that it cannot fall out. The stable housing of the healthcare variant protects the technology not only during drops, but it also withstands aggressive cleansers.